To call Ex Libris one of our staff’s favorite discoveries in recent years would be an understatement. This quintet from Boxtel, The Netherlands showed on their 2008 debut album, Amygdala, that they’re not your typical Dutch female-fronted metal band. They take their love for classical arrangements and mash them up with progressive licks and song structures. Top that off with Dianne van Giersbergen’s dynamic soprano vocals, and you have a metallic-classical amalgam that bears similarity to some of the Dutch femme-metal giants, but is ten times more creative and unpredictable. Since releasing Amygdala, Ex Libris have played a number of gigs in The Netherlands and opened shows for Kingfisher Sky, Stream of Passion, ReVamp, and Epica. And in the past year, Ex Libris have also played their first shows in Belgium and Germany. 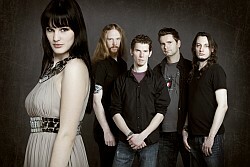 The band has also made time to work on material for their second full-length album, Medea. This album is still in the songwriting stage. However, Ex Libris have recorded three songs for a new promo EP to give fans an idea of what to expect on Medea. Though the promo EP is now available for fans to purchase or download for free, we at Sonic Cathedral have the inside scoop on Ex Libris’ plans for the complete album! "The Amygdala album gave us a great start, but the compositions on the Medea album will be much bolder, the vocal lines more challenging, and the music in total more impressive. We’ve matured as musicians, and so has our music. In composing, we try to renew the challenge of songwriting every time! With our new promo EP, we released three tracks from Medea, set to the tragedy from Greek mythology. To compose this album, we divided the story into different songs and began writing themes to set the characters and amplify the emotions they go through. "After murdering Glauce and Creon and leaving Corinth without a ruler, Medea sets out to commit the ultimate revenge: She murders her own two sons and leaves Jason with his immense grief. Tormented and haunted by her deeds, she flees Corinth, never to return again." Wow! That’s a fascinating inspiration for a concept album! Let’s how Ex Libris has crafted their take on the myth by starting our Sneak Peek of Medea. The disclaimer that Ex Libris should have for this first song is "Hang on!" Breakneck riffs and drumming immediately pulse out of the speakers. They’re soon joined by Koen Stam’s fast-paced, swirling keyboard notes. Just from these first 40 seconds of music, I can already tell that Medea will be darker, heavier, and even more progressive than Amygdala. Dianne swoops into the song now with her expressive soprano voice. She skirts up and down the breadth of her range, showing how her voice has matured since Amygdala. "Medea" continues to exude Ex Libris’ newfound power through each verse and refrain – and then we hit the 4:35 mark: The riffs become choppier, the atmosphere darker, and the longing in Dianne’s vocals even more evident. Paul van den Broek delivers an intricate guitar solo with a screaming end before the rapid-fire arrangements from the intro return to usher the song to its close. This track will make an excellent first track to Medea the full-length album. Besides being the title track and covering the beginning of the myth, it grabs the listener’s attention like a thief’s fist for jewelry. Any song that can do this is the perfect choice to kick off a record. This mostly midtempo track is as sinister as its title implies. The opening riffs and drums churn out a contagious rhythm that urges you to headbang along. Flurries of synth-strings emphasize the evil in Medea’s plan as well as the anxiety Medea must feel. The chorus for "Murderess In Me" is surprisingly catchy; its melody glides and soars above the gritty music. Dianne offers yet another varied performance, from a quiet spoken word passage, to sneers and taunts as she describes how Medea murders her own brother. What makes this song so interesting, however, are the details: the ever-so-slight growl in Dianne’s voice as she sings the line "You’ll make a murderess of me"; the whisper under Dianne’s lead vocal during the final chorus; and soft acoustic guitar and piano notes over the lapping of waves on the shore at the song’s end. And that’s just to name a few details. At 20 seconds short of 8 minutes, "Murderess In Me" is the longest of the three Sneak Peek tracks. (All three songs are about 7 minutes apiece, though!) Ex Libris excels with long songs, however – and this one doesn’t disappoint. WHOA! The moment Joost van de Pas’s drums start punching my senses, I know "Daughter of Corinth" is going to blow me away. This is by far the most dynamic song of the Sneak Peek; it features tempo changes, guitar and keyboard solos, and a number of moments that will get live audiences chanting and jumping. "Daughter of Corinth" also contains the starkest musical contrasts of the EP. Bass lines and cymbals define the calmest sections, while dramatic synth-strings cut as sharply as the guitar riffs do in the heaviest parts. This approach allows every member to have their shining moment on the song. Even bassist Peter den Bakker plays a second or two of quick-fingered magic before the rest of the band comes back in. However, Dianne pulls out every trick from her vocal hat on "Daughter of Corinth." She trills at the highest edge of her range with little effort, and conjures up a witchy alter ego for the song’s only spoken verse. This young lady is undoubtedly the most fearless classically trained vocalist on the metal scene. Then again, "Daughter of Corinth" is one hell of a fearless song, from its battering beginning to its menacing, THX-synth fade-out at the end. This track also accurately portrays the emotions of jealousy, rage, and pride – all emotions that Medea would experience as she exacts her revenge on Glauce and Jason. Consider "Daughter of Corinth" my favorite track of this Sneak Peek – and perhaps my favorite Ex Libris song, next to "Destined." Want your own sneak peek of Medea? 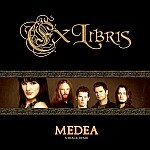 Visit Ex Libris’ official website now to access their Medea Promo EP. Once at the homepage (it should say "the new and improved Ex Libris website"), scroll down to find links to listen to or download "Medea," "Murderess In Me," and "Daughter of Corinth."